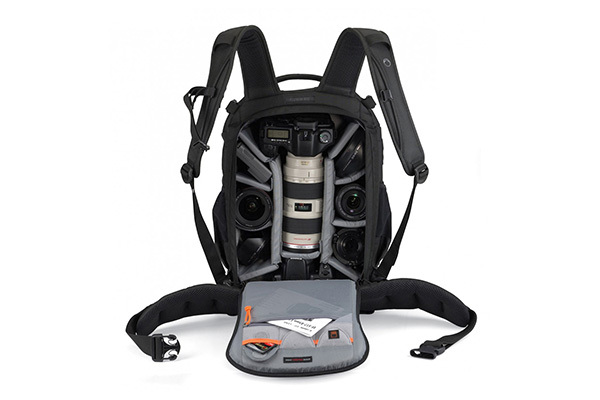 When it comes to extensive outdoor shooting, the Lowepro Flipside 400 AW is in its element. Packing in up to 11 lenses plus a D-SLR, the bag comfortably swallowed our test kit. There’s also a large extra pocket at the front for accessories or a netbook or tablet, and with one zip you can pull out the tripod attachment and secure your set of sticks with a buckle. Out and about the bag felt robust, and securely held our gear, with no movement. The thickened base of the bag isn’t rubberised but because of the Flipside’s design it doesn’t have to be put down in bad conditions – you can swivel the bag around to your front using the waist straps and get in through the rear while still standing. It’s an innovative idea, even if it does feel a little awkward the first few times. We weren’t able to grab our gear particularly fast as there’s no quick access option, and oddly the zips on the back of the bag don’t open all the way down, stopping a couple of inches above the bag base, making access to lenses at the bottom much harder. The waist straps are well-padded and combined with the elasticated sternum strap, they lessen the load, add stability and made for easy breathing. The Flipside 400 AW has a built-in all-weather cover which is designed to protect the bag from dust, heat, sand and water, and because this isn’t black, light is bounced off the bag rather than being absorbed. This, combined with the dust and sand protection, make it ideal for extreme locations such as deserts and in our shower test, the cover excelled in keeping water out, covering the bag in a single fluid motion with no straps to do up and keeping our valuable kit completely dry inside. 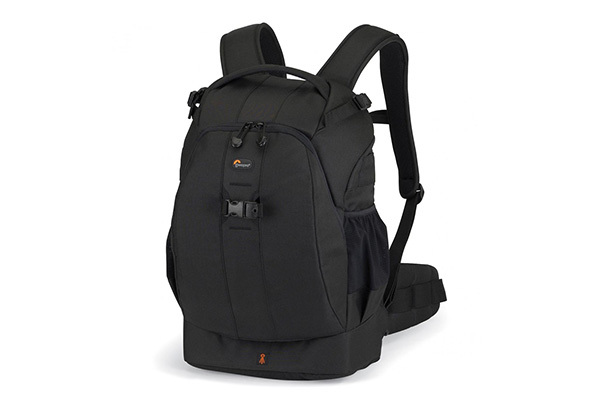 If you’re going out on a day’s shoot, the Lowepro Flipside 400 AW makes light work of accessing your equipment. Its robust and innovative design made the bag extremely versatile, allowing you to pack in loads of gear and neatly organise your accessories so you know exactly where everything is. Its excellent padding means it’s supported evenly along your back and the straps ensure the bag is comfortable to wear for the whole day. It feels robust yet light so won’t unduly increase your load, and its build quality is top-notch – but most importantly, the internal dividers will keep your delicate kit safe and sound. Despite lacking a ‘true’ quick-access function, its swivel concept also impressed us, allowing lenses to be changed without having to put the bag on the ground. This review was first published in the December 2012 issue of Digital Photo - download back issues here.